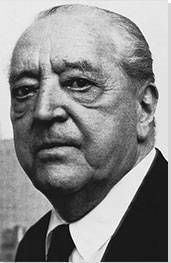 The below artworks are the most important by Ludwig Mies van der Rohe - that both overview the major creative periods, and highlight the greatest achievements by the artist. Artwork description & Analysis: This was Mies' first completed commission, an impressive feat considering he was employed to design it at age 21 and had not even established his own practice (he was still working as an apprentice to Bruno Paul). 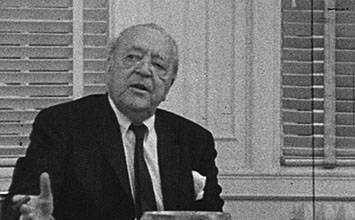 Moreover, Mies' client was Alois Riehl, one of the most significant figures at the time in German philosophy circles and a university professor. Artwork description & Analysis: This was one of Mies' experimental pieces of paper architecture - unbuilt designs on paper - with the distinctly modern building type, the skyscraper, and the possibilities of industrial materials in the early 1920s, what he would soon dub "skin-and-bones architecture." 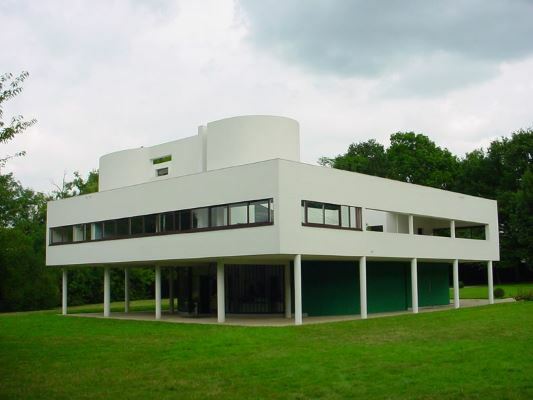 This was complemented in the next few years with his horizontally-oriented projects for brick and concrete country houses, imagined as collections shifting planes for walls and roofs that barely delineated the enclosure of spaces. Artwork description & Analysis: Mies and Lilly Reich together designed the German Pavilion for the 1929 World's Fair in Barcelona - a structure which now ranks among the most significant temporary structures ever built, particularly for an international exposition. Demolished after the fair, it was reconstructed from 1981-86 using the original plans, now in the collection of the Museum of Modern Art in New York. 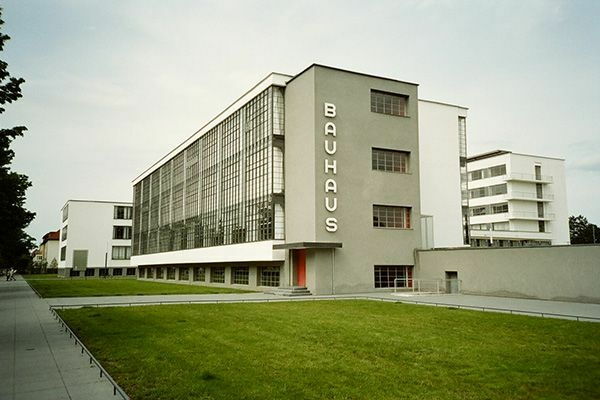 It constitutes Mies' and Reich's most succinct statement in the reduction of a building to the minimal requirements to define space: a handful of columns elevated on a platform juxtaposed with asymmetrically-arranged opaque and transparent wall planes, supporting a flat roof. It functioned during the fair as simply a reception space for dignitaries, as the Weimar government had other space for actual exhibits. 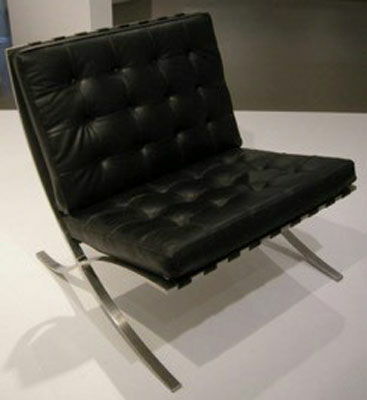 Artwork description & Analysis: Appropriately named for its premiere in the German Pavilion at the 1929 World's Fair, this chair is largely considered the most famous furniture design of the 20th century. The writer Tom Wolfe later highlighted its preeminence by noting how it had achieved "holy grail", cult-like status amongst aesthetes as a piece of furniture that someone might trade all of his belongings in order to afford. 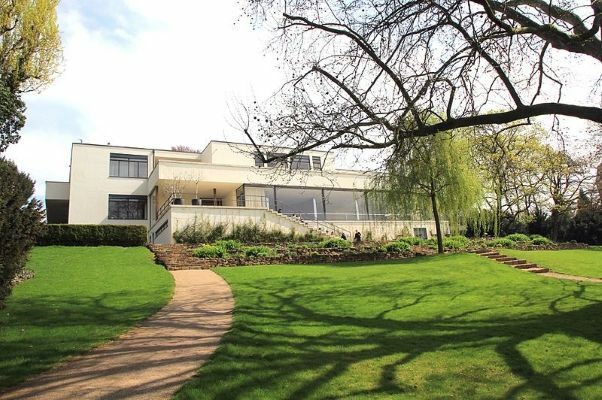 Artwork description & Analysis: Mies' first truly modern house (all his previous realized dwellings had been traditional masonry structures), the Tugendhat House is a superb example of how he used the possibilities of modern construction to blend a building with its landscape. 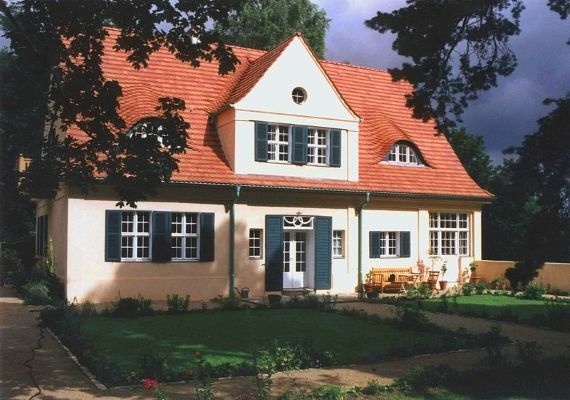 The Tugendhats, a wealthy German Jewish couple who owned several factories in Czechoslovakia, owned this plot of land in a very fashionable suburban part of Brno, located on a hillside with a spectacular vista towards the central part of town below. 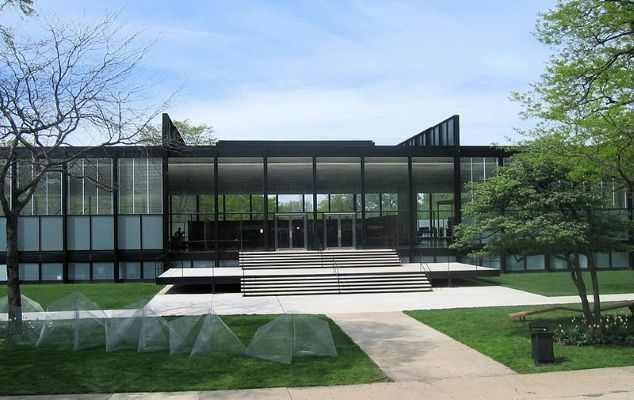 Artwork description & Analysis: Crown Hall, considered by many to be Mies' most important building, is the centerpiece of his larger campus plan for IIT, which he began developing as soon as he arrived on invitation from the school in 1938. Ultimately some 20 buildings were constructed to his designs between the 1940s and the mid-1970s, though three of the original buildings of the Armour Institute, built between 1891 and 1901, were left intact on the west edge of campus. After Mies was removed as campus architect in 1958, a number of commissions for new structures, including the main library, were given to other firms, including Skidmore, Owings & Merrill. 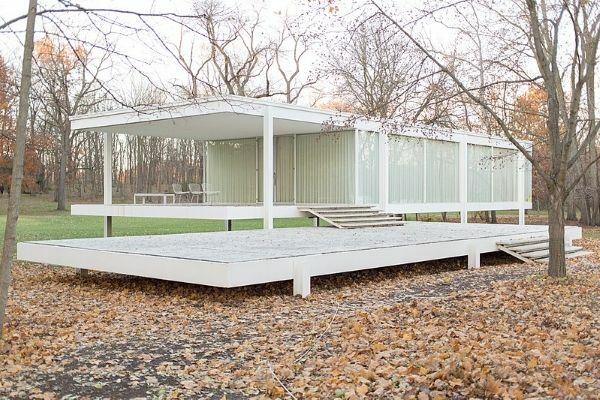 Artwork description & Analysis: Mies' signature postwar residence, the Farnsworth House arguably represents the ultimate in minimalist residential architecture using industrial materials. 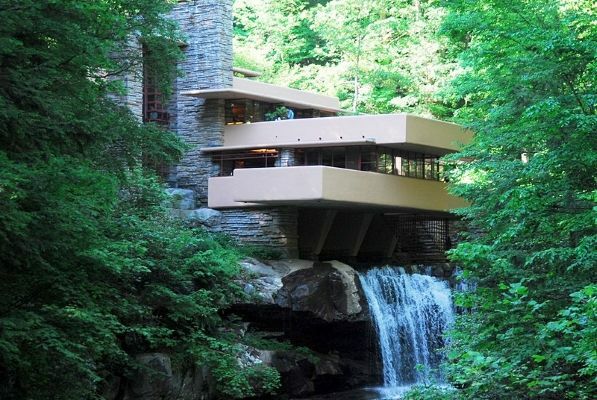 Yet its design and history are far richer than the finished product initially suggests. The house was designed as a weekend retreat for Edith Farnsworth, a physician who owned nine acres of land along the Fox River 50 miles outside Chicago near Plano. 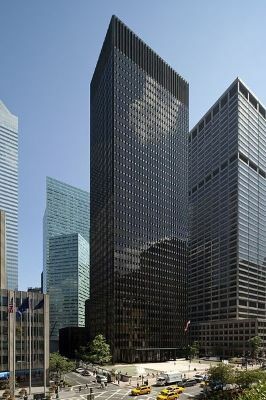 Artwork description & Analysis: The Seagram Building constitutes Mies' definitive, realized statement on the form of the skyscraper. Though he had been working with the type since the early 1920s, the Seagram was the first office tower commission that he was able to build, and his first in New York, which in the 1950s was becoming the hub of skyscrapers-as-symbol of American corporate modernism. 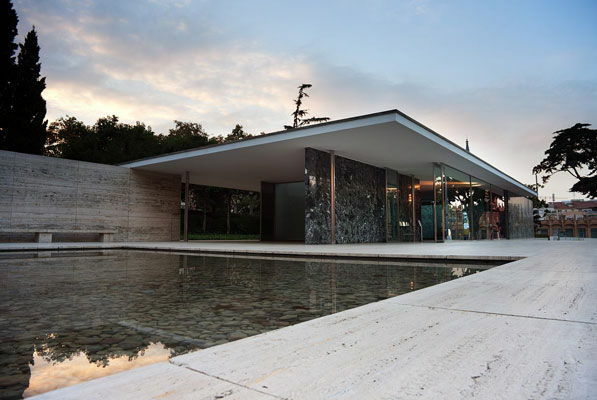 It also represents the close relationship between Mies and Phyllis Lambert, the architecture enthusiast and daughter of Seagram's then-CEO, who would go on to found the Canadian Centre for Architecture in Montreal. (Ironically, Seagram later sold the building and is no longer one of its tenants.) Philip Johnson, then one of Mies' disciples, received the commission to design the Four Seasons Restaurant inside.